Last month, The New York Times published a review of the documentary Before the Flood, a project led by Academy Award winner and environmental activist Leonardo DiCaprio. The film wasn’t as known then as it became this weekend. It was available for free streaming across the Internet. Sounded like Genzlinger gave up on Flood’s mission before it even started. Before The Flood is instead an earnest, straightforward endeavor. 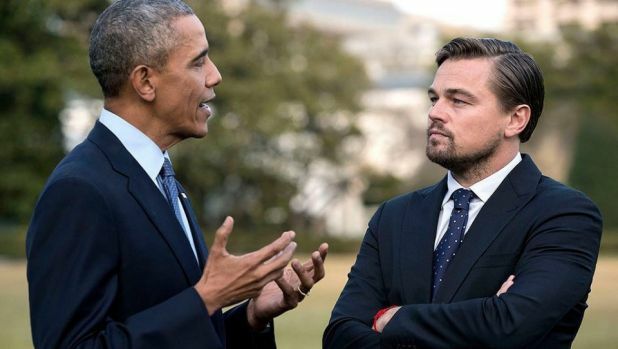 From the start, it took on the FOX News bigots that found it hilarious that, for someone whose dating life has been profiled by PEOPLE magazine, DiCaprio aspires to educate the public on social climate and environmentalism. DiCaprio doesn’t care to prove them wrong. Before The Flood is for the social media generation and better yet, anyone willing to learn and participate in positive change for the planet. The uber-famous actor has been a public activist since roughly the year 2000. The same year he starred in the scenic and underrated The Beach and was asked to be a celebrity spokesperson for Earth Day. He shared in Before The Flood that he trails his dedication and curiosity on nature as far back as his childhood weekends spent at a downtown Los Angeles natural history museum. It was then, and still, at the age of 42, he has wondered how certain animals have gone extinct and natural materials awfully dwindling in growth. Like films before it, such as 2006’s An Inconvenient Truth, Before The Flood exposed the adverse effects of too much carbon dioxide in the air and oil spills across various lands and oceans. (The footage in Flood of these spaces are sobering). But what may be new information to viewers is that much of today’s pollution and increased codependency on non-Earth friendly resources comes from the greedy purpose of getting certain other materials such as vegetable oils for cheap. Vegetable oil is already of lesser value and being able to mass produce it makes it available for fast food, junk food, and toiletries via a lot of household name brands. DiCaprio himself was slightly taken aback by this realization. Mainly because he was aware that, in the U.S., the average American family may have not the time or money to think twice about purchasing certain foods that contain vegetable oils. And especially palm oil, the cheapest to reproduce of them all. During his visit to Haryana, India’s Nuh Village, DiCaprio spoke to Sunita Narain of the Centre for Science and Environment. She and a fellow speaker confirmed that 30% of Indians still do not have electricity in their country. Many that live in villages make smart use of biomass powdery substances to cook and help with basic living needs. In addition to accessible coal. Narain politely expressed affliction with American engineers and during her conversation with DiCaprio, tenaciously confronted America’s lack of a will to change its lifestyle and how it was the biggest offender of pollution. Meanwhile, China, the most populous country in the world (and with its own huge battles with gas and coal) has made major strides to be solar-based. India is on the same path with steady progression. The United States remains the biggest emitter of fossil fuel. “[America’s] consumption is really going to put a whole in the planet. And I think that’s the conversation we need to have. As an American watching Narain, who also showed DiCaprio a book containing a researched chart of just how much energy one American used in comparison to a French, Japanese, and Nigerian citizen, my privilege was checked through a computer screen. I became cognizant to just many Indians did not have seemingly rudimentary additives to living. Viewed Chinese cities blanketed in so much fuel smoke, that wearing a mask was as commonplace for them as a watch on a wrist. I was watching Bef0re The Flood on YouTube with lit up bulbs nearby, a Bath & Body Works candle burning, a tablet on the bed, and an iPhone beside me. Possibly, this type of realism in the film ignited contempt in Genzlinger. Having to be concerned with just how he’ll heat up his DiGiorno pizza will never be an issue for him. (Even the poorest person in American are never as poor as someone overseas. And despite the U.S. being fuel nation, we do not walk around with masks on standby in our Tory Burch bags). “Scenes” such as the vignettes with Narain gave Before The Flood a genuine sense of exploration and outlook that scared straight documentaries Food, Inc. and Sicko purposely forget to include. Renewable, solar, and wind are the answers to a cleaner world. As explained in the film, the ice melting in the northern hemisphere is just one of the hundreds of repercussions of an essentially soiled earth. And that alone has caused more catastrophic floods and droughts around the world. Southern states like Florida and Louisiana have experienced the results, as well as Southeast Asian nations. How can anyone deny the presence of global warming? What does one get out of denying the fact that the amount of forests that have been ravaged by human greed will undoubtedly affect our natural resources? Before The Flood isn’t a farce or hunky dory. If your response is similar to that of the Times, you had very little regard for the planet in the first place. Flood will guide you to be more sensitive to that other world around you that you’ve forgotten about and that was here first: the wild.